On Monday, I was discussing maybe not putting up as much holiday decor, because the whole thought of taking it down in just a few short weeks was making me nauseous. Yesterday, I got a burst of energy and Christmas spirit (no, I wasn’t tasting the eggnog) and knocked out a whole lot of hall decking in just a few hours. Next thing you know I was perched precariously on a ladder stringing pine garland on my husband’s garage. A garage no one can see, but us. And well, . . . it’s a garage. I go from one extreme to another, people. One extreme to another! Let me know if you want your garbage cans glittered or your driveway bordered in 5,000 mini candy canes. It appears that I have the time for that kind of stuff. You go girl! We’ve just dug out after a blizzard and as much as I’d like some lights on my trellis fence it just isn’t going to happen this winter. Any decor will be happening in the comfort of the great indoors… Where glitter is the gift that keeps on giving. We used to put up 7 trees, and it would take me weeks and weeks to decorate. I know… I must have had some kind of fever! Ridiculous when I think on it now. The nativity is set up, and the tree, and a few silver bells. Simple. Hello! I like the CHRISTmas cutouts on your screen door! They need a tiny star on the top of each one! Happy decorating! You are right. They do need stars! I look at that door so often I think I forgot it has trees on it! You made me chuckle. It does seem like we find time for some of the most unimportant things…but we get enjoyment from it! Good luck with all the glitter! Good job! I went out yesterday since it is in the 60-70’s here for 2 days before we get a major ice storm and have no power for a week or more like back in 2009 but I digress. I hung lights but half don’t come on so I went to get new bulbs but they don’t carry that kind and then I thought I’d get new lights but they had no colored…only white so what’s up is up and we won’t have power anyway so no one will see them! LOL! Merry Christmas! LOL Yes, I think I do need my garbage cans glittered! We haven’t added a single decoration outside yet, but Chris is busy getting the backyard ice rink frame tonight for the approaching arctic blast. I’ll take one glittered garbage can and a candy cane driveway please. Glad you found your holiday spirit. 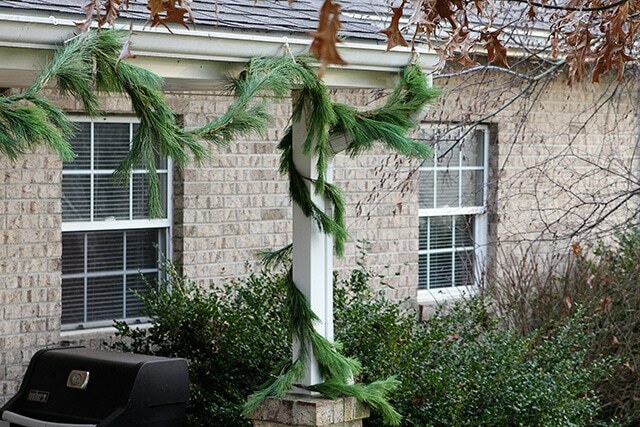 Your pine garland looks very festive on your garage, Pam! 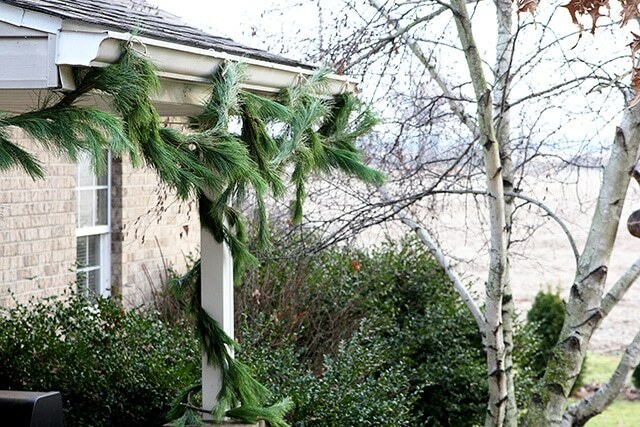 And I love your screen door with the pine tree cut outs. Sweet! We add a string of big old fashioned lights to our garage that only we can see, but it makes me happy to see them when we’re eating dinner. You go girl! You sound like me, I have gotten so I hate the chore of taking it down! Why I use to empty out every china cabinet and decorate….ugggh. The burst of energy will keep us going! I need a burst of energy!!!! Love the garage garland! Hilarious! 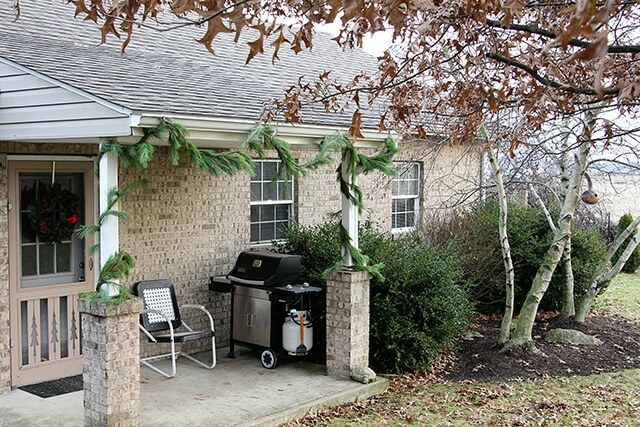 I could use you for my front porch topiaries…can’t seem to get the lights on them! There’s no stopping you now! Looks good!